Bitsy Spider wants to have everyone over to her new pumpkin house for a good ol' fashioned harvest party. Unfortunately, everyone has their own ideas about what makes a party special. 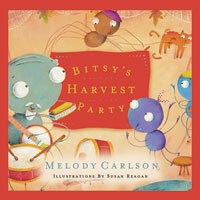 Bitsy is only one spider and she knows she is not good at cooking, decorating, creating party games, or playing music. Will the party ever be able to happen? Ha! I laugh. Nothing can scare me! But, what was that? Something's knocking, rocking, just unlocking what could it be? I hear growling, howling, something yowling I can't see! What's begun is all in fun, but just beware of what's out there! I'm trying in a fun way to show you what to do when you're feeling just a little frightened by your own shadow. All you have to remember is that God is in those shadows, behind the masks, and always there whether the light's on or off. You can have fun because He's with you always! 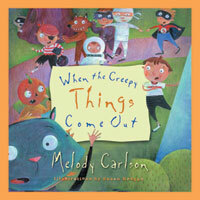 Just as a little boy named Sam and an old man named Henry remind the town of Easterville, best-selling author Melody Carlson reminds us as well that the true meaning of Easter is not Easter bonnets, baskets, colored eggs, candy, or decorations. It is the glorious story of a cross on a hill and an empty tomb, and the wonderful news of forgiveness that the Easter story brings us. Gather your family for a journey to the true meaning of Christmas. Along the way you'll unwrap the many layers of God's wondrous gift and discover afresh His saving love. Thirty-one captivating readings, written just for kids, Share the full Christmas story from Creation to Christ's return. And you can help reinforce the truths they'll learn by discussing the questions at the end of each reading.